In this series of video recap videos of SXSW 2015, we highlight our favorite moments during Ableton Spaces. Catch an inside look into a festival space of workshops, panels, demonstrations, performances, and games with Dubspot Instructors, Ableton specialists, Certified Trainers, and some of our favorite artists. Over the past three decades, SXSW (South by Southwest) has been building momentum as one of the most prominent art and technology events in the world. It’s a place where artists break new music, companies introduce new technology, and new alliances are formed for ten days each year in Austin, Texas. Dubspot has been attending SXSW annually to present our unique brand of education, highlight our talented staff, and to get a taste of what’s new in technology, film and sound for the coming year. For SXSW 2015 we have assembled a team of educators, creators, and thinkers for a series of events including workshops, live performances, DJ sets, discussions, and more. 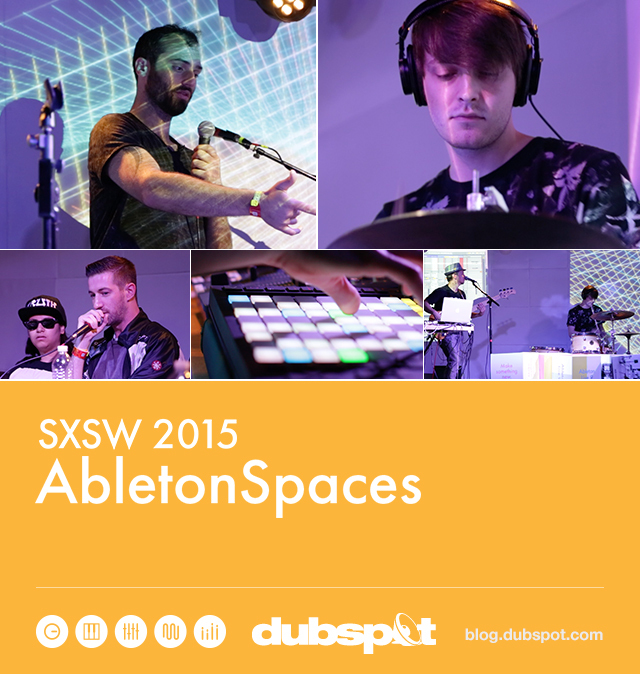 Dubspot teamed up with our friends at Ableton once again during SXSW 2015 to host a day of workshops and panels at the Ableton Spaces. This video captures a series of workshops, demonstrations, performances, and an Ableton Trivia Game Show that took place over the two days at South by Southwest. All made possible by Dubspot Instructors, Live and Push specialists, Certified Trainers, and some of our favorite artists. In this video, Ableton artist panel participants including Kode9, Ikonika, DJ Spinn, and Kastle talk about how recent developments in digital technology are giving musicians more tools than ever to express themselves in new ways. These tools are allowing creators to push production and performance to new heights, and they are redefining how we can manipulate sound. In a world with so many options, how do you find a unique workflow that allows you to express yourself creatively? Dubspot and Ableton present a panel discussion hosted by Adriano Clemente and Dan Freeman on live production and performance techniques that will touch on workflow, collaboration, and getting out of a creative rut. In this video, Dubspot Instructor and Ableton Live Certified Trainer Dan Freeman demonstrates how to integrate Ableton Live 9 into a live band performance setup. Dan takes us into his live performance setup and talks about incorporating remixing and DJ techniques in a live band performance, syncing drums to Ableton, processing instruments and vocals live, and looping audio clips. In addition, Dan shares tips on integrating Ableton into a band context and live performance with the Ableton Push. In this video, Dubspot Instructor and Ableton Live Certified Trainer Adriano Clemente and Producer/Push user Decap demonstrate how to build beats from scratch with Ableton Live 9 and the innovative new Push controller. The two talk about beat creation, adding and manipulating instruments, working with effects, improvisation, arrangement, incorporating external hardware, and having fun with Push. In this video, Ableton guru’s partake in an epic battle of Ableton wisdom during this interactive game show at SXSW 2015. Watch as fellow enthusiasts show off their Ableton knowledge in this Jeopardy-meets-Price is Right[-ish] style trivia game. The South by Southwest (SXSW) Conferences and Festivals offer the unique convergence of original music, independent films, and emerging technologies. Fostering creative and professional growth alike, SXSW is the premier destination for discovery.